This blog entry will help you if you are facing the error message “CHANGE_NOT_ALLOWED” while trying to logon to your Business Objects System using SAP authentication. I checked the SAP authentication within CMC which was working fine. The RFC User was not locked and also able to import new BW roles to the Business Objects System. 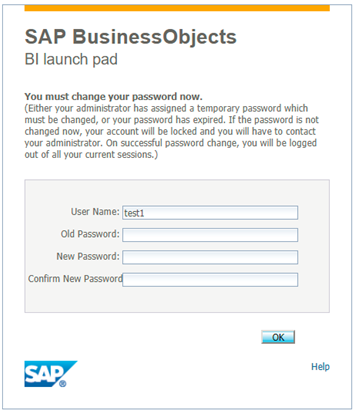 With BIP 4.2 SP5 you are now able to directly change an expired password while logging on to the BI Launchpad for example. That means that SAP changed the way how user authentication works between BIP and BW backend system. In our case the system RFC user had an initial password but was not allowed to change the password. After changing the password from initial to productive in the bw backend system the logon with SAP authentication was working again! 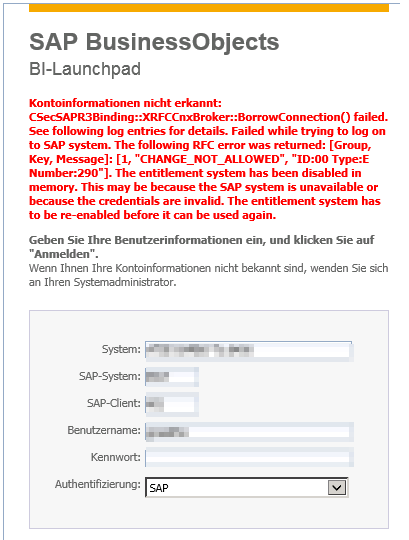 Same problem after the upgrade but it doesn’t work, still the error message…..do we need special set up in SAP BW? Hi, did you check the password status for your background user in BW? It shouldn´t be initial. Thank you very much for this thread. We’re upgrading to BO4.2 Sp5 and we’re using BW4Hana as BW System. User check showed, that the technical user still had the initial password. So we changed the user to dialog user, changed his password in BW4 and changed user back to communication user. And see, the user and roles get updated properly by now!